This fan commemorates the Montgolfier brothers Joseph-Michel Montgolfier (left, 1740-1810) and Jacques-Étienne Montgolfier (right, 1745-1799), inventors the globe aérostatique (hot air balloon). The central scene shows the brothers’ first public experiment, which took place in Annonay, France on June 4th, 1783 in front of a group of state representatives. That day, a balloon inflated with hot air produced by the combustion of straw and wool, rose approximately 6,000 feet in the air and traveled over a mile in 10 minutes. Within a year, the Montgolfiers had presented their balloon to Louis XVI and his court at Versailles, and had proceeded to design a larger balloon to carry passengers. This new balloon, enclosed by an oval cartouche on the lower half of the fan, was made in collaboration with the wallpaper manufacturer Jean-Baptiste Réveillon. The decorative scheme of the seventy-five feet tall vessel honored the king; fleur-de-lis and the royal monogram were shown in blue and gold, the traditional colors of the French monarchy. In this balloon, Étienne Montgolfier was the first human to achieve flight. 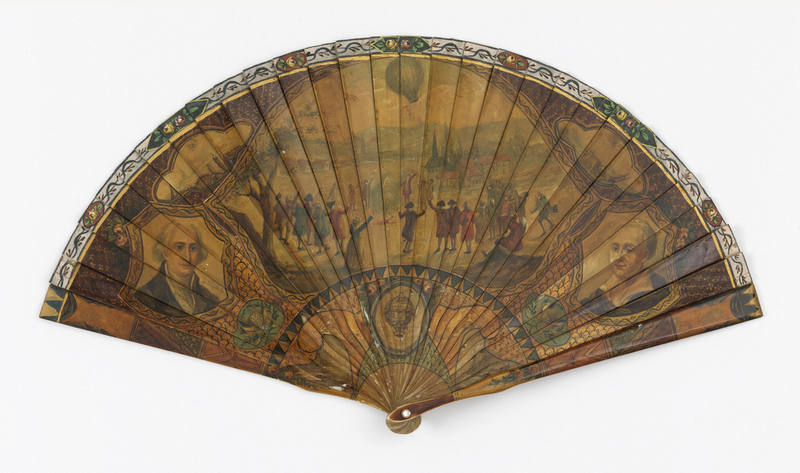 This fan may have been created to mark the 100th anniversary of that momentous event of 1783. The color palette of green and gold was intended to resemble vernis Martin, imitation lacquer made in France during the eighteenth century. The aesthetics and subject matter of the previous century were highly popular during La Belle Époque of the late nineteenth century.